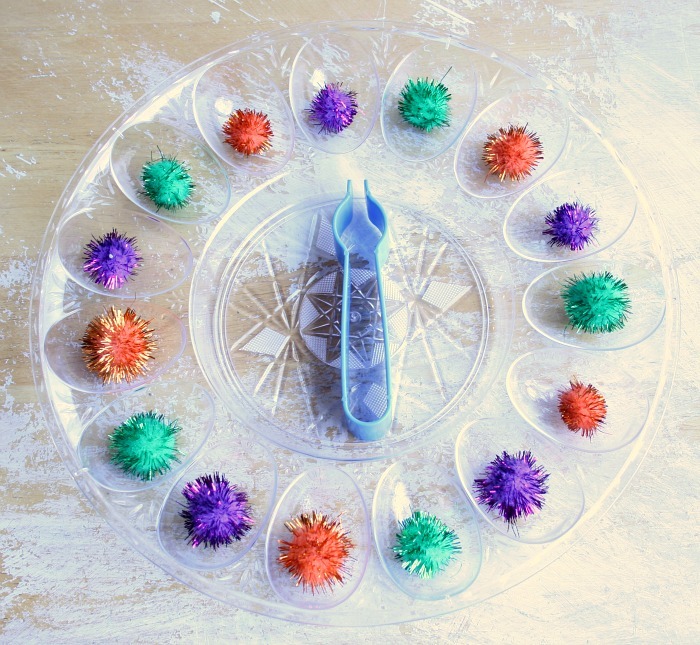 For those of you who are looking for Halloween-themed preschool activities, this one counts because the pom poms are purple and orange and green and spiky. Uhh... the end. Otherwise this is just a cool preschool activity that you could do any old time. But aren't those really the best kind? I think so. And did I mention that it's so easy to set up? Let's get started! 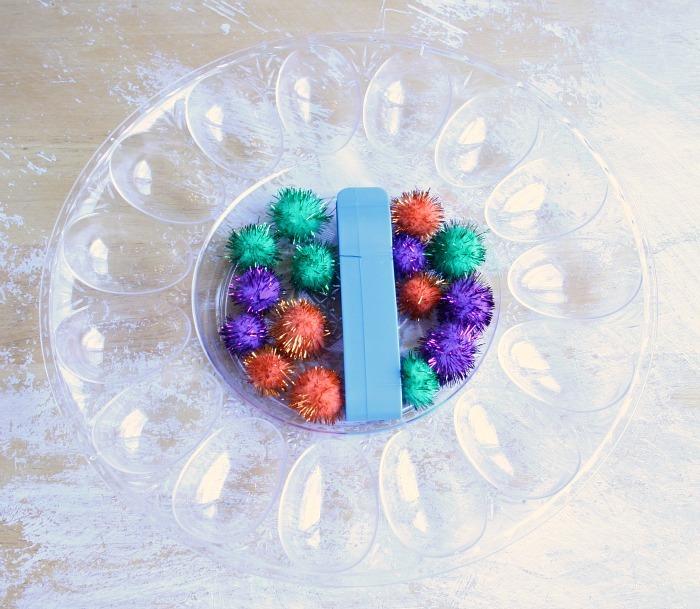 On a deviled egg tray (or another tray with lots of little compartments), add one pom pom per compartment and a pair of tongs. If you're going to make a pattern with the pom poms, make sure there are the right amount of each color of pom pom. 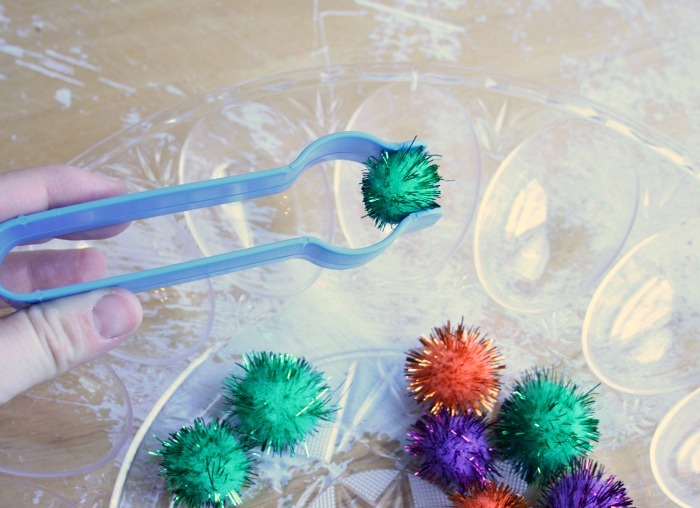 Using the tongs, pick up one pom pom at a time and place it in a compartment. Begin at the top compartment and work clockwise. The pattern we chose to make was "green, orange, purple." Before we start making our pattern, I tell Olivia, "Okay, Olivia, the pattern we're going to make is 'green, orange, purple. Green, orange, purple.' What pattern are we going to make?" She replies, "Green, orange, purple." Then we start. She's usually really great about remembering the pattern and recreating it accurately, but if she gets one in the wrong order I point it out and she fixes it. Often times she'll notice the mistake herself before I even say anything. I personally think that helping kids make accurate corrections (and right away, not a long time after they make the mistake) is only doing them a favor. If I don't correct her, she won't know there was a mistake. And if I wait too long to correct her, she may have forgotten why it mattered. Don't be afraid to help your kids! Once the pattern is complete, ask your child to "read" the pattern back to you to check and make sure it's right all the way around. Just start at the first pom pom and say each color. Hearing it out loud will (hopefully) help them notice if there are still any mistakes. Hearing it out loud will also help them learn the rhythm to the pattern and get a basic understanding of the idea that patterns repeat. 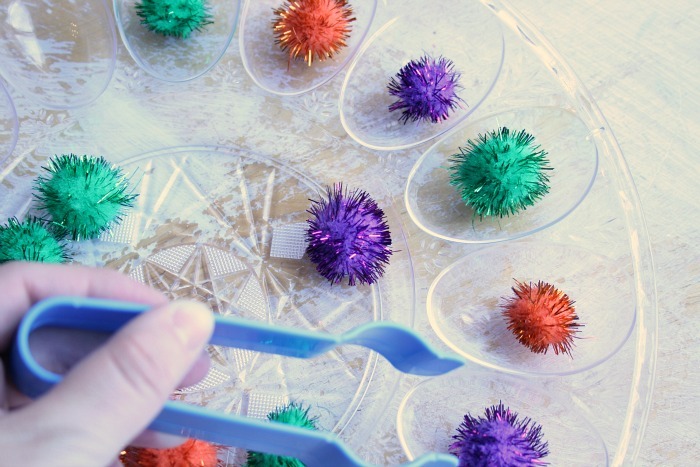 Once you've checked your pattern (and made any necessary corrections), start with the first pom pom and use the tongs to put each pom pom away one at a time. Often Olivia likes to say the pattern again while she picks them up to put them away. 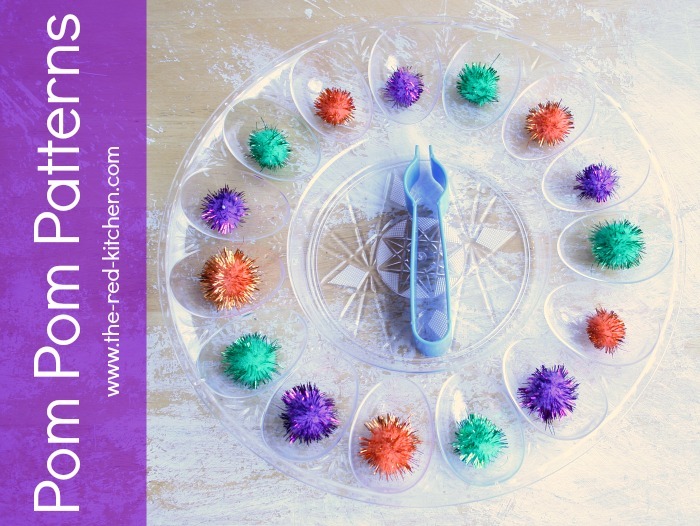 You could also use this opportunity to practice one-to-one counting and count each pom pom as you put it away. Be sure to try out the rest of this year's fun Halloween preschool activities! 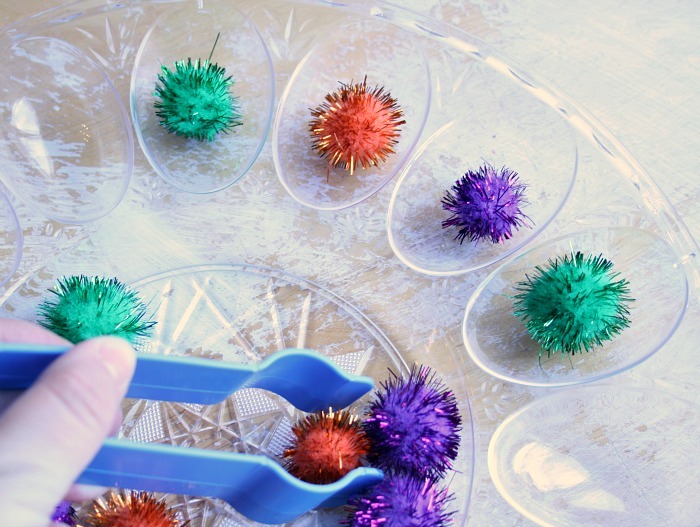 While you're at it, try out these other fun pattern-making and fine motor activities! 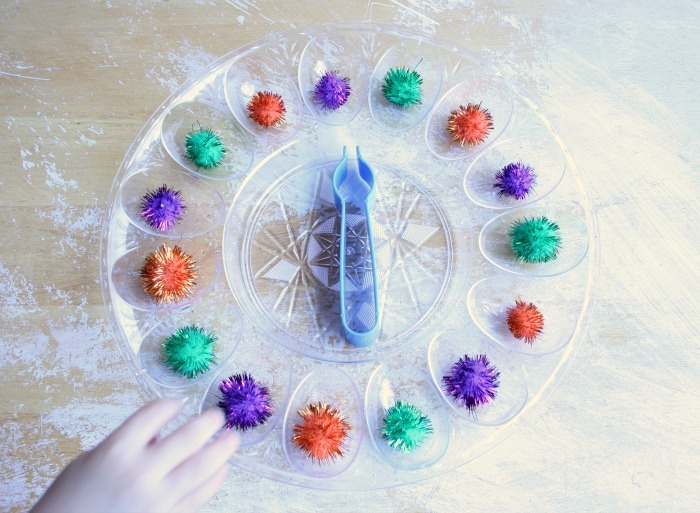 Find more fun and easy preschool ideas on the Preschool page. You can also find them by clicking on the Preschool button in the header. Enjoy! I love the concept of correcting mistakes right away. I honestly think that if some of my high school seniors in remedial writing class had been taught this way when they were little, they would have WAAAAAY fewer problems with punctuation errors. They probably wouldn't even be in my class.